It’s nearly time for the launch of The NewBridge Project : Gateshead, with its opening set to be marked by a new exhibition, Reality Check, with opening night Friday 13th October, and running until Saturday 28th October. The NewBridge Project : Gateshead is set to provide a home to develop the next generation of artists and creatives in the region, with pioneering new graduate development programme The Collective Studio at the core of this. The collaboration between Newcastle University’s Institute for Creative Arts Practice (NICAP) and The NewBridge Project, will see a formerly vacant shop unit on Gateshead High Street transformed into a base for 20 artists, photographers, curators, architects, filmmakers, musicians and writers as they begin their careers. The launch exhibition Reality Check, brings together works by eight early-career artists, resulting from The NewBridge Project’s 2016-17 Graduate Programme in partnership with Newcastle University. Exploring the role and identity of the artists and its connection to the everyday, engaging with a broad range of societal contexts from manual to emotional labour and introspective to extrospective ways of being and seeing, Reality Check features works by Lucien Anderson, Jon Cornbill, Oliver Doe, Emily Garvey, Louie Pegna, Alice Rout, Helen Shaddock and Olivia Turner. 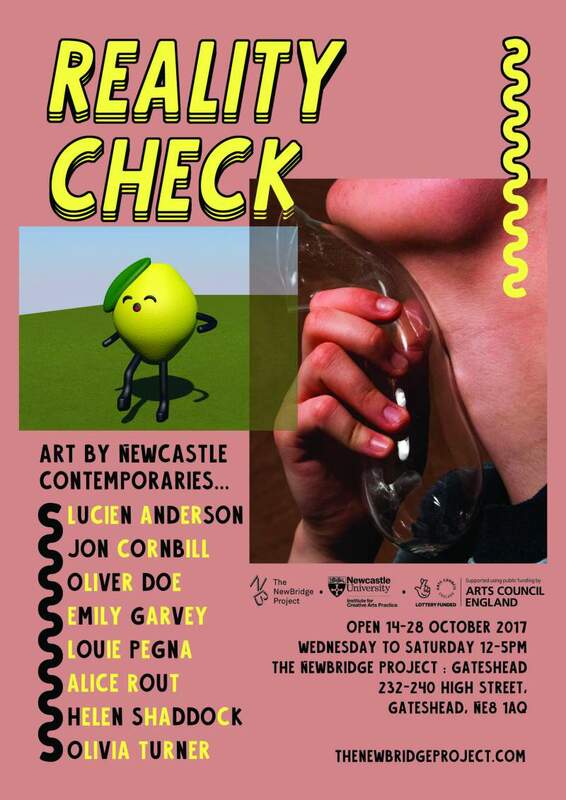 Reality Check’s launch is at The NewBridge Project : Gateshead on Friday 13th October, and runs until Saturday 28th October.